It’s the flavor of fall all over this moist coconut pumpkin cake drizzles with golden coconut cream caramel. 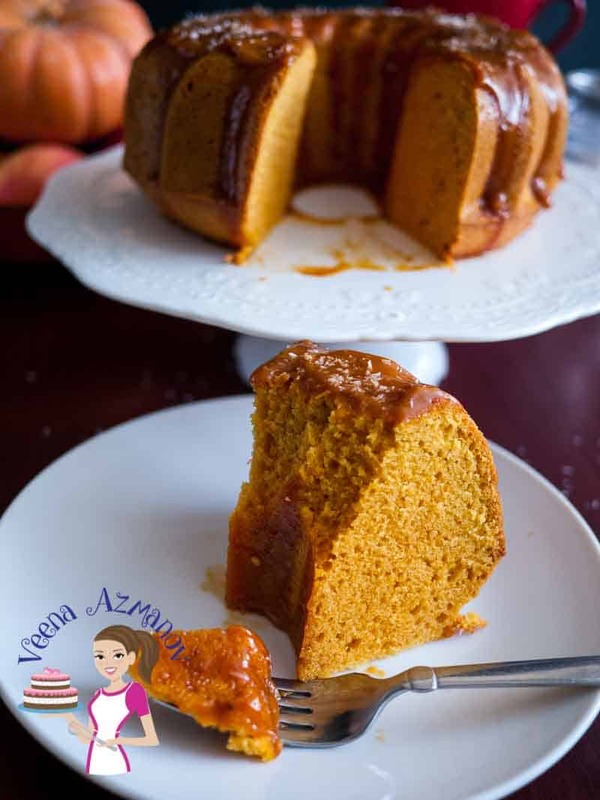 The cake is a light and fully moist batter with the flavor of molasses from the brown sugar then enriched with pumpkin puree, pumpkin spice, and coconut cream before baking to perfection. A perfect fall-inspired coffee cake with a cuppa anytime of the day. Don’t you just love this time of the year? The weather is so gorgeous we’ve been having some fun entertaining with friends. I made these to take with me at a friends place this week and it was such a hit! especially the coconut caramel that I was forced to promise them I’d be posting the recipe as soon as I get home!! One of the ladies wanted to make it for her family Thanksgiving dinner as her folks from the US are coming here. Everything about this cake is, ‘fall’ and so gorgeous. The colors, the taste, the flavors!! Yum!! I love pumpkin spice and this time of the year. it’s anything pumpkin spice for me. The other spice that really gets me this weather is gingerbread spice. Oh, the warmth of these spices and the senses are so in tune with the weather. My mom would make us have our milk with gingerbread spice before going to bed once it started getting cooler. She’d say it will warm your body from the inside so it will be able to handle the outside cold. I try to do that with my kids too! Coconut cream – The only coconut flavor you have here is this coconut cream -I use thick coconut cream from the can. In fact, I do not shake the can when removing it from the pantry. So the liquid that’s at the bottom stays undisturbed. When I open the can I get this thick luscious coconut cream that is so rich and really enhances the flavors? Don’t worry if you have just regular coconut cream, works just as well. 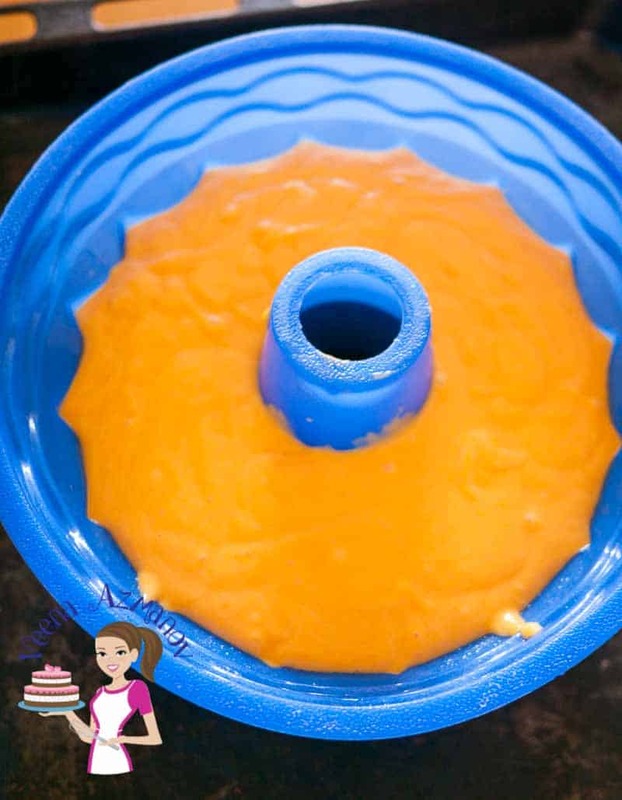 Pumpkin Puree – I usually use canned pumpkin puree. I am too lazy to make my own. But please feel free to make your own. Just make sure you use a nice thick puree not too much liquid as it will affect the end results. 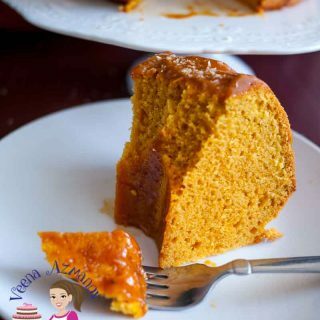 Brown Sugar – You can use white sugar as well but the flavor that the molasses brings in this cake while so subtle is truly wonderful. I highly recommend using it. Pumpkin Spice – Of course in keeping with the pumpkin cake theme I’ve used pumpkin spice but if you prefer to go ahead and experiment with gingerbread spice mix. It still has all those warm flavors going. 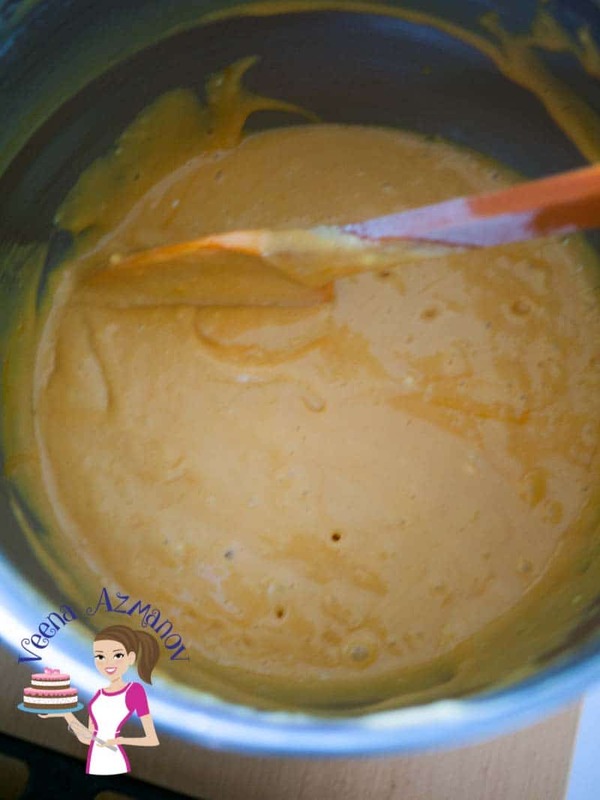 Canola Oil – I prefer to use oil in this batter as I think it really keeps the cake very moist and light. But if you prefer butter you can use about 170 grams of butter in this recipe. It does work I have tried it before. Personally, I do prefer oil. 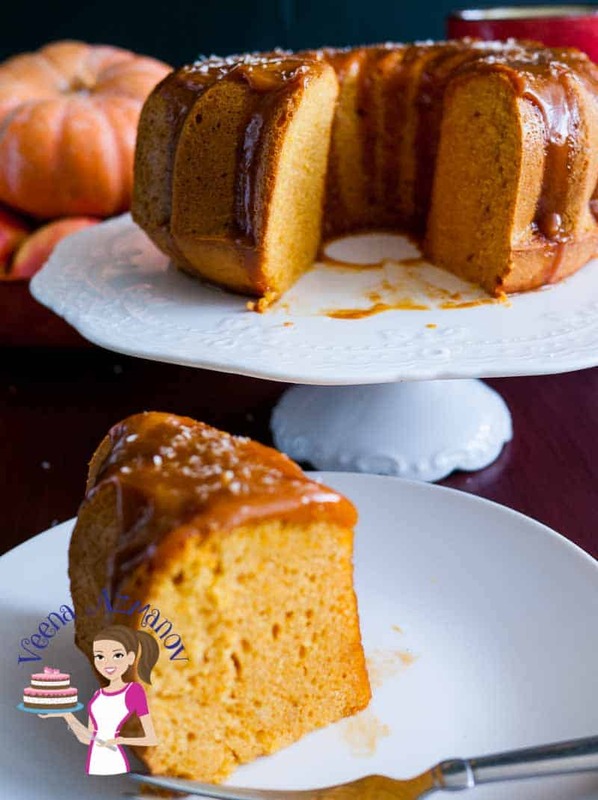 Food color – The pumpkin puree usually gives the cake a very pale color especially because of the brown sugar. I like my pumpkin cake to be a bit more orange so I enhance it with a few drops of orange food color. You can, of course, omit it because the color does not affect taste in any way. Desiccated coconut for garnish – 2 tbsp. Stop the mixer and fold in the pumpkin puree with a spatula. Lastly, fold in the flour mixture. Cut off the dome if any so you have a level cake. Cool completely before you pour the glaze on. When the sugar starts to caramelize – reduce heat and let it come slowly to a deep amber color. Add the coconut cream in two batches being very careful as the caramel will rise and be very steamy. Lastly, add the pumpkin spice and vanilla. Set aside to cool – use on the cooled cake. Pour the glaze over the top in spoon fulls so you can direct the drip. If the glaze is too stiff – just microwave it for 10 secs. I used a little- desiccated coconut to garnish the top. The glaze is delicious – make extra and serve alongside. It's the flavor of fall all over this moist coconut pumpkin cake drizzles with golden coconut cream caramel. 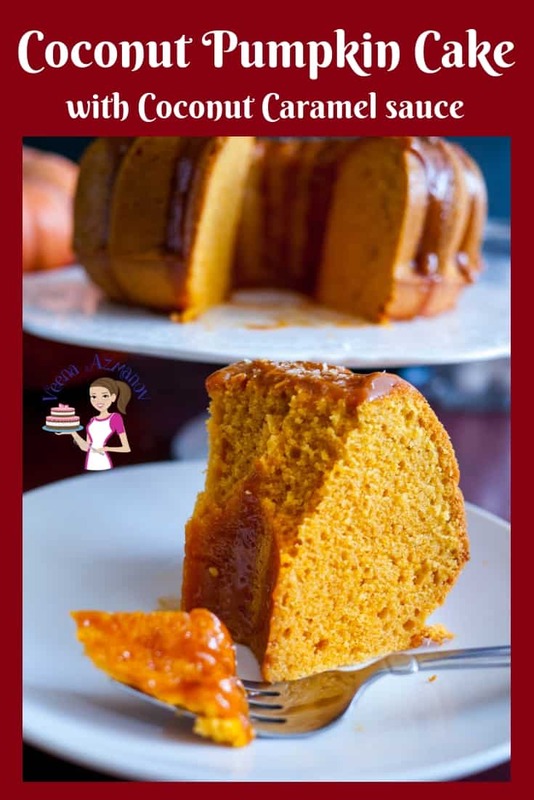 The cake is a light and fully moist batter with the flavor of molasses from the brown sugar then enriched with pumpkin puree, pumpkin spice, and coconut cream before baking to perfection. When the sugar starts to caramelize - reduce heat and let it come slowly to a deep amber color. Set aside to cool - use on the cooled cake. If the glaze is too stiff - just microwave it for 10 secs. I used a little-desiccated coconut to garnish the top. The glaze is delicious - make extra and serve alongside. 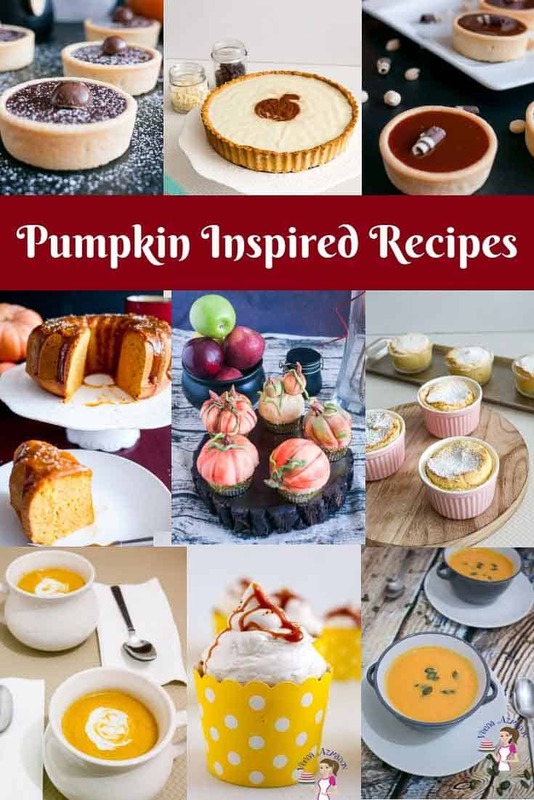 Easy pumpkin inspired recipes, Collection of pumpkin desserts, pumpkin soups. I need to make this frosting! It sounds amazing! Ohhh! Coconut cream makes the cake super moist and delicious right?! This looks so good! 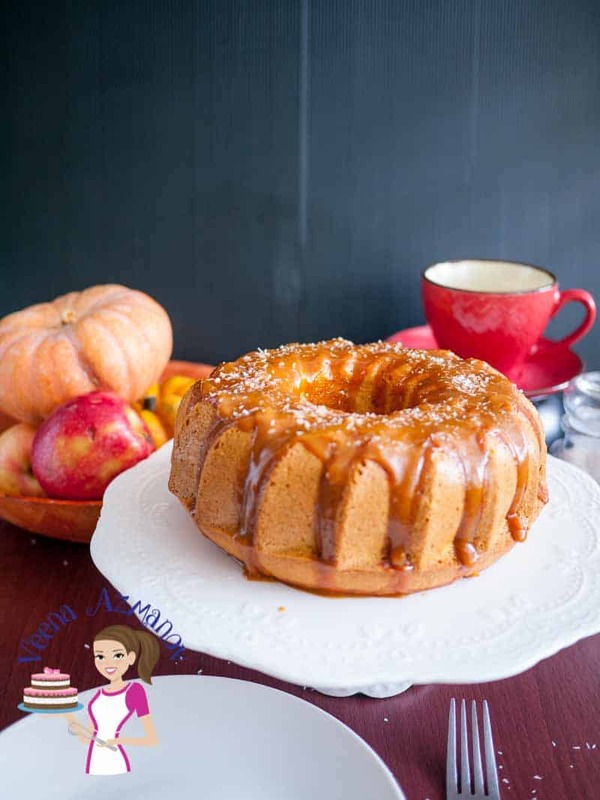 Pumpkin cake is always great this time of year! Absolutely Anna – Pumpkin is always a great treat this time of the year. Oh-my-goodness! I love Pumpkin Cakes and I love caramel. This is the perfect marriage between the two! Thank you, Nicole – Hope you try this soon. Absolutely, Tammy. It is a moist cake. That coconut cream caramel sounds to die for. Such a unique flavor combination with the pumpkin too! I can’t wait to try this. Thank you, Daniela. yes, it’s so delicious. 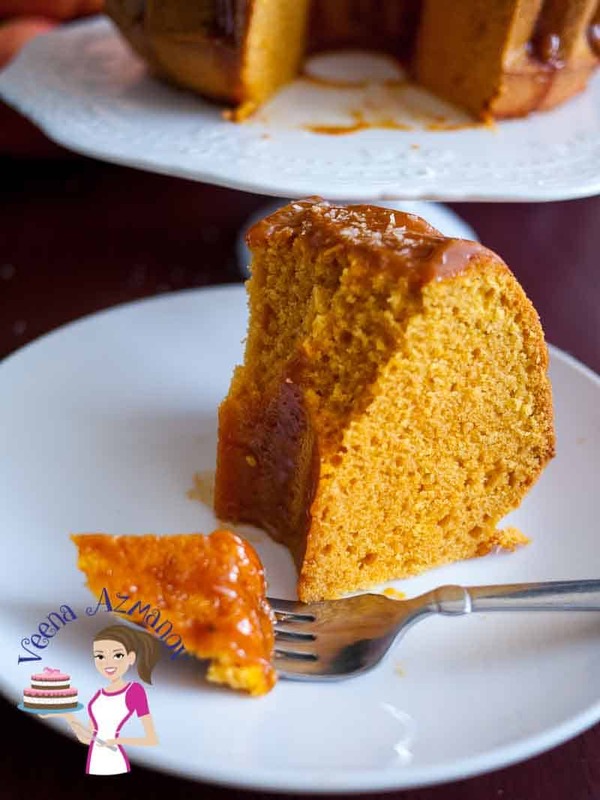 Yet to use pumpkin in a cake, but looking at your cake right now, I am salivating! 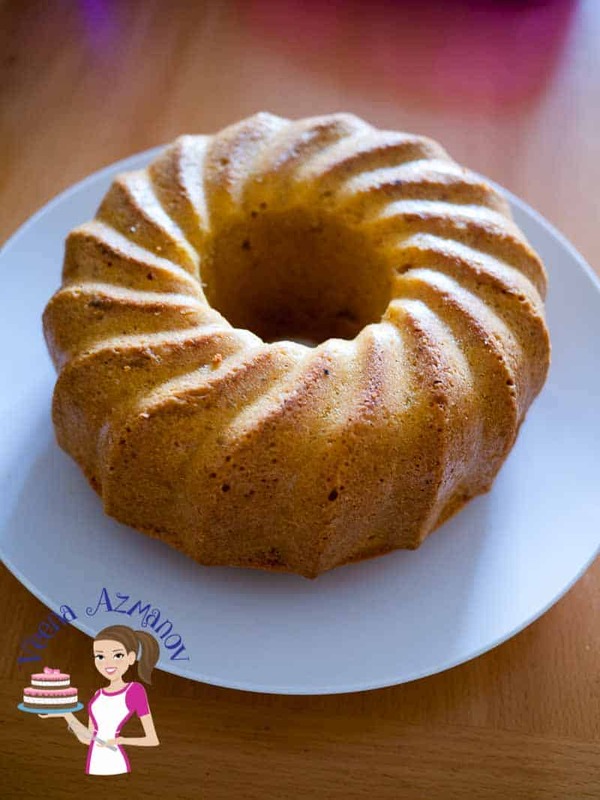 The beautifully baked cake looks so rich and moist! Oh, you must try pumpkin in cake. So delish jagruti. 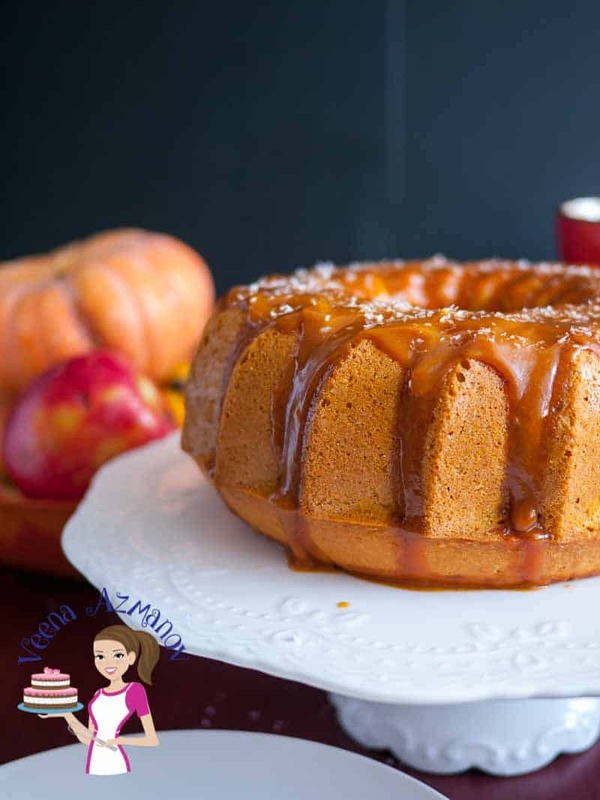 This is such a refreshing fall favorite cake. Pumpkin cake with coconut – wow brilliant combo really. Cake looks just what you said , moist and delicious! Thank you, Jyothi. Yes, it sure is wonderful. This cake looks so moist and fluffy and that coconut cream caramel frosting took my heart by storm! Love the bright orange color – this look would make it perfect for Halloween, too! Great photography! Pumpkin desserts are wonderful this time of year. Veena!! I love this!! I’m making one this weekend! Will post pictures and tag you! Ah awesome, Noel. I think you will love it. I made it! They loved it! I didn’t get any pictures … because it was gone so fast! But wow oh wow, everybody raved over it! Aww, so happy to hear that Noel. Thank you so much for coming back to leave this feedback. Happy everyone enjoyed it so much. Ahhh, any excuse to break out the old bundt pan. The sight of a finished product screams classic dessert. And the possibilities are endless. Thanks for the inspiration. Absolutely, Analida. You will love these. Aww, thank you, Elaine. So happy to hear that. Yes, you will love this one. I never would have thought of combining pumpkin and coconut together but this sounds wonderful! Can’t wait to try! Thank you Shantel – Happy to hear you have great success with this recipe. Thank you so much for coming back to write this feedback, appreciate it very much. How interested that you use food color. I would never have thought to do that but that’s a great tip. I love all the flavors you used here but that glaze sounds out of this world. I am not much of a baker because I would eat everything I bake. (I love baked goods). However I will have to give this a try for my in laws. They too would love it. Thank you Denise. I believe we eat thru our eyes first. And I love a good orange color for my pumpkin cake. The frosting was to die for. I bet that coconut cream adds so much flavor to this beautiful pumpkin cake.Coconut and pumpkin are two of my favorite flavors. Your description of the coconut cream has me salivating. The cake looks rich and moist. It certainly would be perfect for a special occasion. 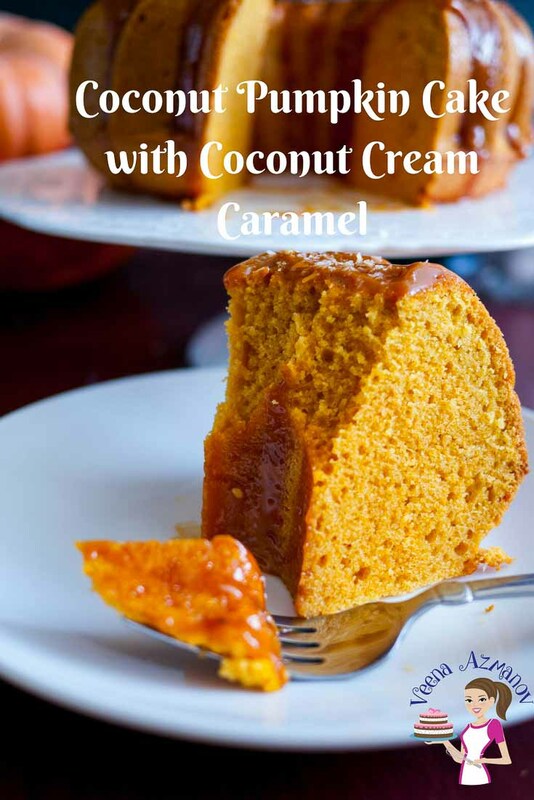 Pumpkin and caramel certainly make a fantastic duo — certainly one of my favorite flavor combinations but the touch of coconut just takes it over the top. Bundt cakes are awesome. No fuss and delicious. The flavour profile sounds amazing….and OMG that sauce would be so delicious. This would make dinner guests very happy….and there would be NO leftovers either.